A split match between the Horseshoe and Four Island pools at Decoy Lakes saw some fine weights taken in the latest Ramsey AS match. 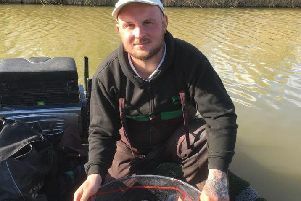 Leading the way from peg five on Four Island was Rob Wright with a huge 259lb 12oz, then came Peter Holland from peg 20 on Horseshoe with 123lb 3oz from peg 20 taken on pellet up in the water. John Paine was third with 103lb followed by Dave Williams on 99lb 12oz. Winning pair were Wright and Vern Edgley with a total of 303lb 15oz followed by Peter Holland and Dave Yardy with 193lb 7oz. Fenland rods were back at Decoy Lakes on Sunday fishing the Damson Lake which surprised a few fishing by producing some much bigger than expected weights. Top rod was the in-form Mac Campbell. He caught well all day fishing sweetcorn to weigh 124lb 6oz. In second place with 100lb was Kev Lee, another angler on sweetcorn. Third place went to James Garner with an 82lb 10oz catch - all his fish caught on meat. Decoy Lakes Saturday Open, Cedar Lake: 1 S. Coaten, Decoy, 225lb 3oz; 2 S. Pell, Spalding, 103lb 12oz; 3 D. Carlton, Decoy, 155lb 9oz. Decoy Lakes Sunday Open, Beastie Lake: 1 L. Marlow, Bag Em, 182lb 11oz; 2 W. Shepherd, Ringer Baits, 174lb 2oz; 3 S. Clark, Image, 155lb 3oz.